Mythic, worshipped in ancient Greece, dates vary, beginning circa 1600 B.C.E. 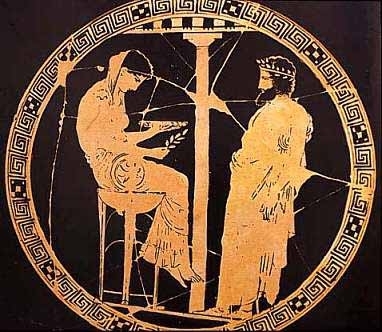 The priestess Pythia, keeper of Apollo’s oracle at Delphi, took her name from Python. Devotees would consult Pythia, who sat in an inner chamber of the temple, unseen by her audience, through a male priest. She herself was merely a conduit for Apollo’s prophetic powers; possessed by his spirit, she would supply answers that were interpreted by the male priest and transmitted to the petitioners.